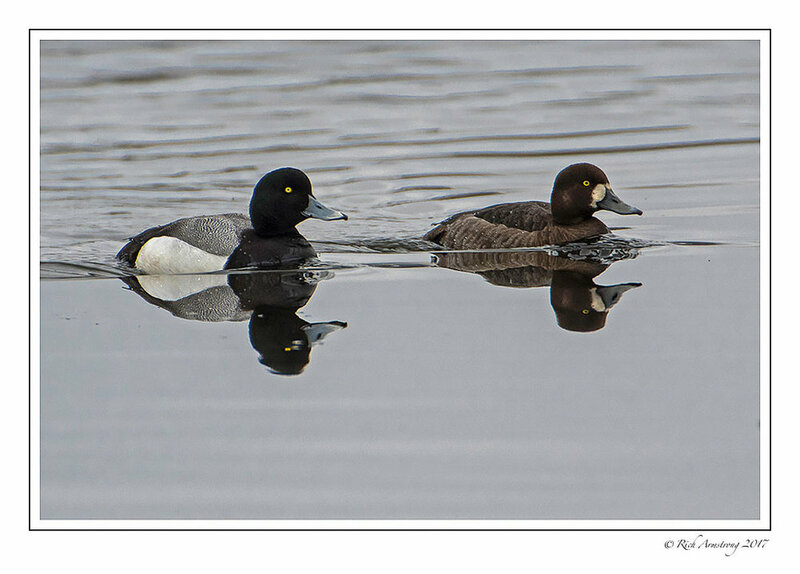 The term “scaup” refers to both the greater and lesser scaup, and they are very similar in appearance. 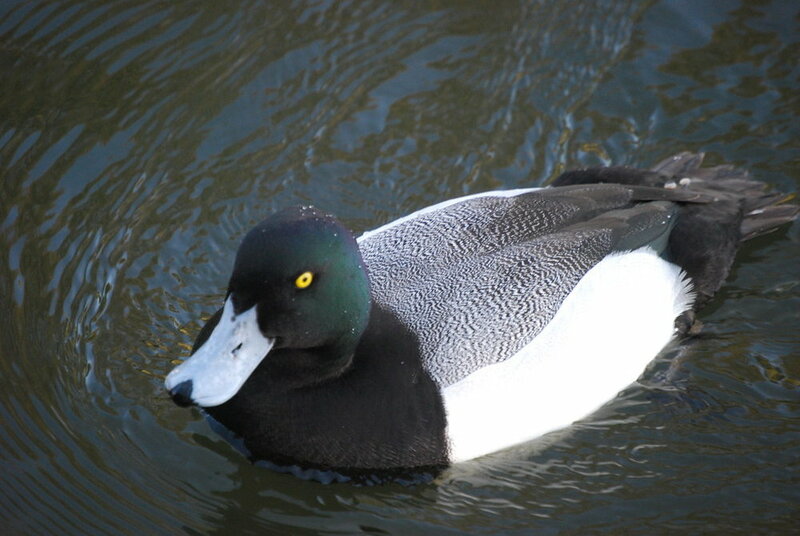 Greater scaup are about one fifth larger than lesser scaup, and their heads are more round with an iridescent green sheen as opposed to purple of the lesser. A black nail on the tip of the bill is more prominent in greater scaup. Greater scaup breed in the far north on tundra wetlands, while lesser scaup range all the way from western Alaska to Ontario and south to the Dakotas. Of the two, lesser scaup are far more common, and probably make up more than 99% of the scaup counted at Goose Pond. During migration, scaup can gather into massive groups, and they are iconic birds to those who maintain an intimate relationship with large water bodies. In Wisconsin, this means the Mississippi River, Lake Superior, Lake Michigan, Lake Poygan, and Lake Mendota. 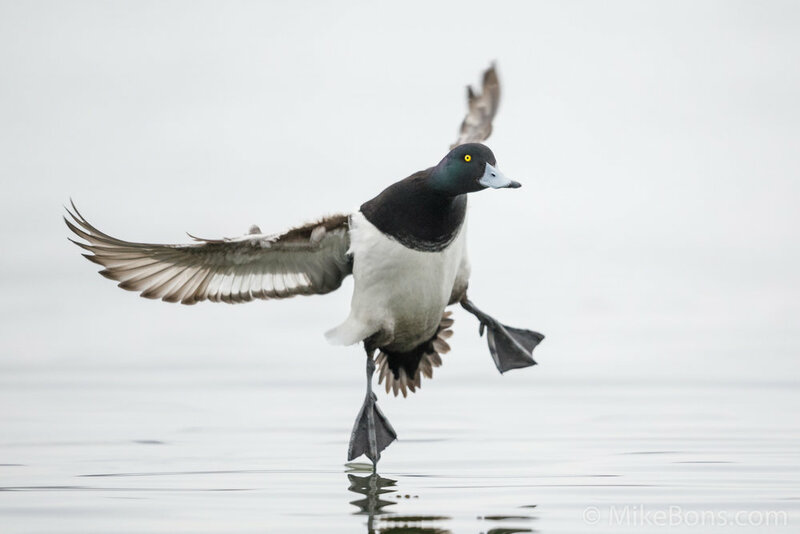 There is a long and unique history of hunting scaup (or “bluebills” to waterfowlers) on Lake Winnebago. That is not to say, however, that they don’t use smaller habitats scattered through every county in the state. Twenty-five people from Wisconsin Society for Ornithology visited Goose Pond on a field trip to view the migration on March 23. Tom Schultz helped lead the field trip, and he reported seven lesser scaup and a single greater scaup. Scaup are “diving ducks” which feed in over a foot of water and consume more animal matter, as opposed to ‘“puddle ducks” that skim the water or “tip” feeding mostly on vegetation. Even though row crop fields are terrible habitat for usual diving duck prey species like snails and mussels, scaup can take advantage of waste corn. Scaup banding efforts even bait their swim in traps with corn. The highest scaup concentrations at Goose Pond Sanctuary occur on flooded agricultural fields. Low Hen Survival- The survival of adult breeding hens has been shown to significantly influence population change. This is a well established perspective that spans the waterfowl community. We know it’s important, but data on the major drivers for hen survival is limited. Predation at nesting sites takes a heavy toll on hens, and unlike more reproductively competitive duck species, scaup don’t breed until their second year. This factor is readily visible at Goose Pond; only about 20% of the scaup surveyed were hens. Contamination- Biomagnification causes higher heavy metal concentrations to build up in predators that feed in contaminated areas. Selenium can result in duckling deformities and poor health. To complicate this issue, recent studies show that scaup have been increasing their dependence on invasive zebra mussels as a food source, which contain more selenium than most of their native counterparts. Selenium enters the environment through mining, industrial manufacturing, and other human influence. Wetland Loss- Much of the water in Canada and Alaska lies over a solid layer of permafrost. As permafrost melts, surface water is allowed to infiltrate into the ground and the land dries out. Canada is warming at twice the rate of the global average, and wetland loss related to melting permafrost will likely be a major contributor to the decline of scaup and an unknown number of species across biotic groups. 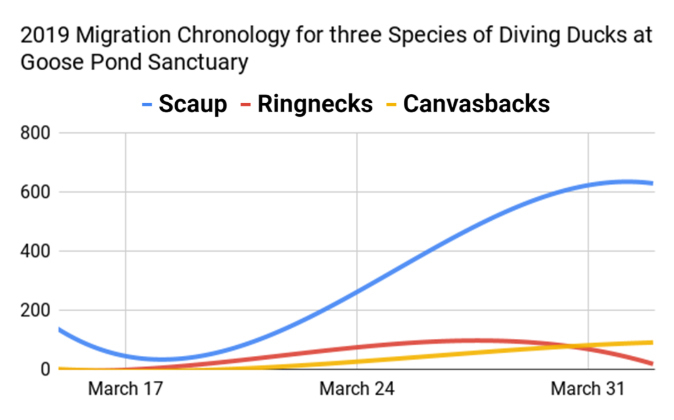 A graph showing the fluctuating presence of scaup, ringnecks, and canvasbacks at Goose Pond Sanctuary. On March 29, I counted 620 scaup around Goose Pond, a record high count since MAS staff started regular waterfowl surveys started here in 1980. To be fair, the all time high count of 800 scaup was reported by William Hilsenhoff on April 9, 1960. They can presently be seen from Goose Pond Road or Kampen Road at ten yards or less associating with canvasbacks, redheads, and ring-necked ducks. Runoff from snowmelt caused Goose Pond water levels to rise to unprecedented levels, and waterfowl of all kinds are utilizing the flooded landscape for food and rest. 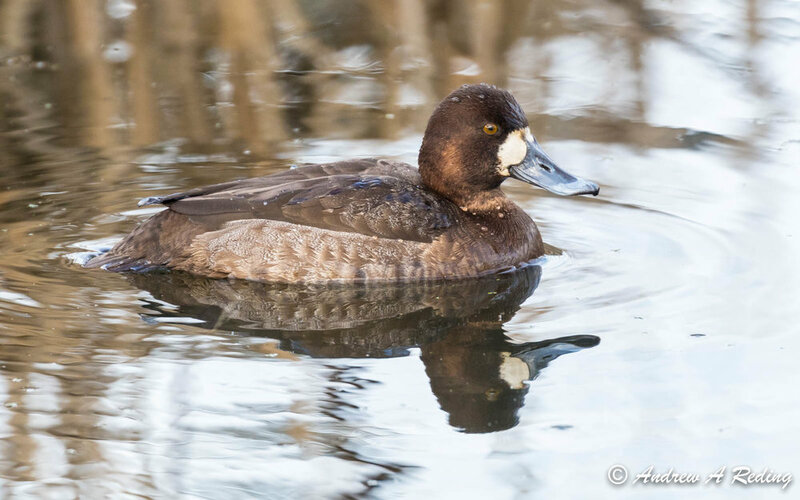 Scaup populations are in rough shape, but seeing hundreds of them wheel around Goose Pond sparks optimism for the future of this striking species.